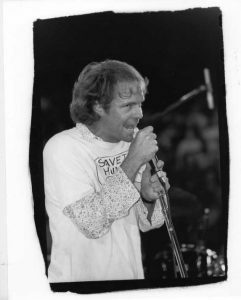 The year was 1993 and Molly Johnson organized a very important concert to bring awareness to AIDS. The show was called The Kumbuya Festival. I was sent there as a photographer to cover the show for Performer magazine. Ontario Place Forum was packed with all kinds of other media people, including Much Music with almost all their VJ’s. People like Erica Ehm, and Steve”Agony” Anthony, and many others were covering as much of the event as possible. Now, to get back to my moment with Gord Downie, I was photographing every musician I ran into, when I heard Gord just entered the building. I heard he had been doing interviews all day and was heading into another one. I saw him through the crowd and approached him and asked him if I could take a few pictures of him. He politely said, he just found out that his wife wanted to see him, so I said, “go and see your wife, she is more important”. He began to walk away, when all of a sudden he turned around came back and hugged me and said, “You are the coolest guy here today”. As the show was progressing, I got to meet other very cool Canadian musicians like Alex Lifeson, Tom Cochrane, and Blue Rodeo and was having fun capturing the entire day. The Tragically Hip was the final band to come on and the time was getting close. Backstage was starting to clear, because I think everyone wanted to go out and see the Hip perform. I bumped into Gord Downie again and he recognized me from earlier. He came up to me and said, “Do you still want that photo of me”? I said, “Yes”. “Ok just follow me and you will get the shot”. So I stood with the entire band waiting to see what was going to happen next. Well the next thing I hear is from outside from the stage is, “Ladies and Gentlemen, Canada, for all you guys out there and all you people here at Ontario Place Forum, to wrap up Kumbuya ‘93, The Tragically Hip! Gord grabs me and says follow me. I go walking out onto the revolving stage with the band and Gord says, “Sit there and take all the pictures you want”. As a young photographer my mind was blown. I just got invited to a very special event and got a prime location to do a shoot. I was practically shaking not knowing what I was supposed to do. 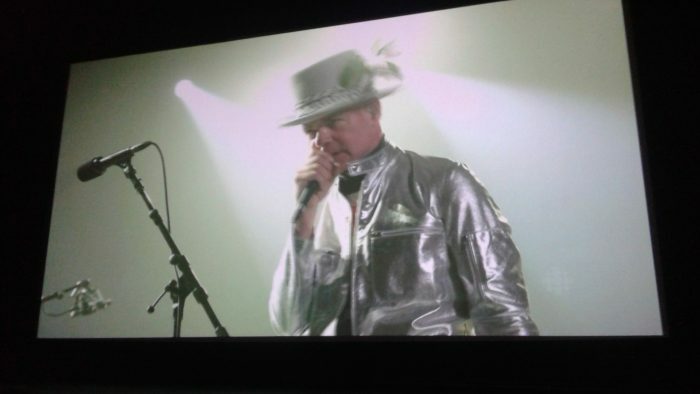 I composed myself and had a great time watching what Gord did best. He completely owned the entire audience and I was less than ten feet away from him doing what I loved doing. Thank You Gord for being a true Canadian, Your lyrics are a part of our history, your character made us a very interesting nation to focus on, your band is a unique force that makes us want to fly our flag a little higher. Your presence definitely radiated throughout this entire country and I hope your recent messages can help heal some old wounds that this Nation carried on for too long.